Bring your Music to Light right out of the box! 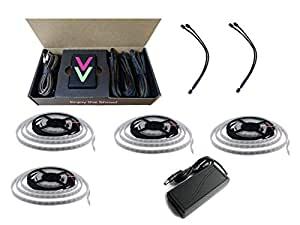 This complete kit includes everything you need for easy plug and play setup for autonomously generated stunning music reactive light shows! Make an LED display in your home, control lights in your car, install a mobile DJ setup, strap it to your bike, add excitement to your bar, or use it in costumes. ViVi is the first music LED controller designed to be fully automated and sound reactive out of the box. ViVi can help anyone create complex high performance light shows for all types of music. VibeLink Bluetooth app makes it easy to configure and create your own visual atmosphere. Each of three outputs can be adjust independently, change the color, brightness, animations, and more one each, it’s like having THREE-CONTROLLERS-IN-ONE. Made in the USA! Includes one standard ViVi Music LED Controller Kit PLUS 4 x LED strips, 1 x power supply, and 2 x LED Splitters. The standard kit includes 3 x LED adapter cables, 3 x 2m LED extensions cables, 1 x Microphone, 1 x 3.5mm AUX cable, and 1 x 3.5mm splitter. ViVi is 3X more powerful than other LED controllers, with exclusive VibeSync technology that utilizes 3 unique outputs that can be customized via the VibeLink Bluetooth app. ViVi only works with Digitally Adressable RGB LEDs, not standard RGB LEDs that change the whole strip at once, each LED on the strip is controlled separately to create vibrant visuals. Enhance your atmosphere as ViVi can use different frequencies and showcase various animations and colors. You only need one ViVi controller to manage up to 12 addressable LED strips and up to 900 unique LEDs addresses, making it the most robust and versatile music reactive led controller on the market, with constant development to add more features and support to fit your next project. VibeSync’s proprietary sound analysis technology thinks beyond the âgrey zoneâ (brightness based on volume) like other music led controllers and provides precision beat matching by listening and outputting across 3 EQ frequencies for the ultimate visual vibe. ViVi is portable, versatile and easily expandable so you can âBring Your Music to Lightâ any way you want. You can liven up any party, wow a crowd, or fuel your creativity all for a fraction of the cost of existing products and without the endless hours of setup and programming. No more flimsy remotes that get lost all the time! Easily adjust the color, animation, max brightness, and more with the free VibeLink app. There are millions of possible configurations to fine tune ViVi to match your exact preferences, or you can choose dynamic modes that let ViVi continuously change the show for you. Android/iOS Support.